Happy Publication Day to Mark Edwards and Thomas & Mercer! This brilliant book is out today for you all to enjoy! You’ll find the link to buy below. Wow, another awesome read by Mark Edwards! 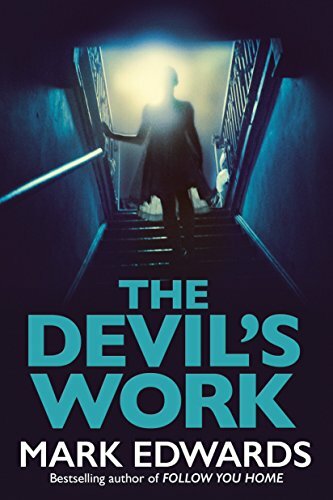 I thoroughly enjoyed Follow You Home so I was very excited to receive a review copy of The Devil’s Work. I was sure I would love it and I haven’t been disappointed! If you love a good psychological thriller you won’t go far wrong with this one. Sophie is going back to work after having her daughter. She’s had a lovely 4 years off, ensuring she didn’t miss those precious first years, but Daisy is now going to school and Sophie is over the moon to be starting a new chapter in her life, a fabulous new career with Jackdaw Books. I couldn’t help but share Sophie’s excitement. Who wouldn’t want to work for a successful publishing company? I would be over the moon too, as well as incredibly nervous. She had never left Daisy before, but she was in safe hands with her father, Guy. Sophie soon starts to have issues with Cassie, a very clever and determined young lady on her team. Cassie is obviously very ambitious and seems to Sophie like she would stop at nothing to further her career. Would she lie and manipulate herself to the top or is Sophie just being paranoid? What really happened to her predecessor, Miranda? No-one seems to have a clue where she is. As things start to fall apart around her, Sophie becomes more and more convinced that Cassie is behind it all. Quite early on we are introduced to Jasmine, but we don’t immediately know what happened to her. When we first flashback to Sophie’s University days we learn that Jasmine was Sophie’s best friend at the time. They were chalk and cheese, but very close. That is until Liam came along to complicate things. The Devil’s Work is dark and disturbing in parts. Full of suspense. I really love Mark Edwards’ writing. The story flits effortlessly between 2015 and Sophie’s University days, gradually revealing the shocking truth. Brilliantly written, it kept me turning those pages as I had to know what Cassie was playing at and what happened to Jasmine. Although it was clear early on that Sophie’s new job wasn’t going to be as glamorous as she’d imagined, I had no idea where the story was going until almost at the end when I started to have my suspicions. I still didn’t get it entirely right though! An excellent, excellent read! I highly recommend. Many thanks to Mark Edwards and Thomas & Mercer for my paperback review copy. This is sure to be a bestseller! Mark loves hearing from readers and can be contacted via his website, http://www.markedwardsauthor.com. Previous Article #AskMeAnything with #bookblogger Christina Huber…..